Recently, I joined a diverse group of people coming together for a common cause: I was a volunteer for a coastal cleanup in Malta. A coastal cleanup is a fantastic activity to do wherever you are in the world. There were many in Roatan, but I was never able to take part because of work or other commitments. This time around, I offer no excuses. What is a Coastal Cleanup? The primary purpose of a coastal cleanup is to sweep an entire area for garbage. Typically, there will be people on land combing the coastline while scuba divers and/or snorkelers get into the water to collect whatever they can find. While scuba divers are known for their conservation efforts and often bring trash back to the surface after a dive, it’s not always easy to prioritize that without proper preparation. Not many divers bring a bag on a dive, so carrying rubbish throughout your “fun” dive can be a pain. These divers came to the coastal cleanup prepared and ready to collect whatever they could! A coastal cleanup is a team effort to handle the pollution problem head-on. Depending upon the area, it might take a few hours or it could take days to truly make a dent in the amount of rubbish around. If you’ve never walked along a bit of coastline that isn’t monitored daily by tourism operators, you might have no idea how bad the world’s trash problem is now. Beachfront hotels and resorts often maintain the beach to the point that visitors never see what has washed up overnight. If you’ve never lived in a coastal area where currents bring in endless plastics and deposit them along the shore, you might think the problem is overstated and we’re just overreacting. Let me assure you: the endless stream of trash in the oceans is a massive problem and it does affect you. As a volunteer for a coastal cleanup, you’ll be asked to grab a trash bag and collect anything and everything in your path. That can be as small as the (probably plentiful) cigarette butts or as big as the toilet someone found at our cleanup. Yes…an actual toilet. The organizers might assign you to a specific area, they may offer you gloves, or you might just be sent off to independently figure it out. The coastal cleanup I participated in was an effort to clean Mistra Bay in northern Malta. The major problem with the trash along this specific area is that it attracts rats. These rats feed on the organic leftovers from hikers, picnickers, and beachgoers who frequent this otherwise beautiful area. Except it’s not just trash that the rats feed on…they are also attracted to the many bird’s nests located on the adjacent St. Paul’s Island. That island is a Natura 2000 sanctuary for Yelkouan Shearwater (also called Garnija) birds. Overlooking St. Paul’s Island. You can see how close it is to Mistra Bay, allowing rats to swim and attack bird’s nests. These Garnija seabirds found in Malta comprise about 10% of the remaining global population of the species. That makes them incredibly important in conservation matters, so these rats’ appetites are quite an issue. If people are more careful about their garbage and dispose of it properly, odds are that the rats will find somewhere else to go. They won’t find enough to eat here in Mistra Bay, so they’ll be less of a danger to the Garnija bird nests, too. Less trash and protecting baby birds? Win-win! In an effort to protect this vulnerable population, volunteers gathered at the Mistra Battery to collect gloves, trash bags, and recycling bags to take care of the remnants that other people had left behind. What we found over the course of about three hours ranged from mundane to bizarre. The end result was two large dumpsters filled with bags of trash from land and sea. This was the final trip from the top of the hill to the dumpster. The car was filled and refilled countless times. Talk about dedication! The Mistra Bay coastal cleanup was organized by BirdLife Malta. This organization’s mission is to protect the bird species that call the Maltese islands home or that stop here along their migratory routes. For this coastal cleanup, BirdLife collaborated with Maltaqua Dive Centre, SharkLab Malta, Zibel, the Malta National Aquarium, and the U.S. Embassy. U.S. Ambassador Kathleen Hill, Mellieha Council Vice Mayor Clayton Bartolo, and Project Manager Paulo Lago Barreiro from LIFE Arcipelagu Garnija. Not knowing that the embassy was involved, I was surprised when I walked up to the group to see countless American flags on t-shirts. I actually had to choke back laughter because my Irish-Colombian always comments on the American affinity for flags. He’s perpetually baffled by the multitude waving outside homes and businesses all around the U.S.
And, here I am, in Malta, surrounded by American flags yet again. It was for good reason though! I had no idea that the U.S. Embassy in Malta organizes regular community events like this coastal cleanup. The flag t-shirts were worn by embassy staff…and let me tell you, they were there in full force! I was especially impressed to see even the Ambassador herself out there with gloves on collecting trash for hours. Her security detail nearby, she was out in the brush getting her hands dirty alongside her whole staff and the many other volunteers. 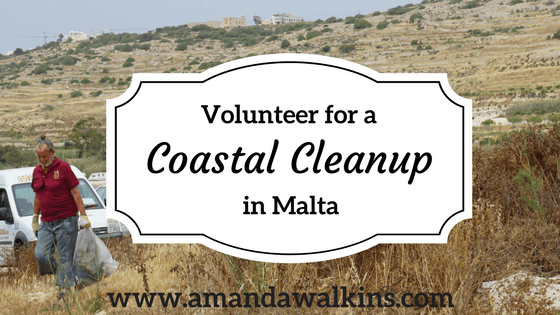 If you have the opportunity to volunteer for a coastal cleanup in Malta – or wherever you live – I highly recommend you do. It’s a great way to do something tangible for your local community. If you can’t find one in your area, organize one! A great day to do so would be Saturday, September 16th, since it’s International Coastal Cleanup Day. Regardless of when you organize one, Ocean Conservancy has a great breakdown of what to do before, during, and after a coastal cleanup. If you’re an expat, helping to organize or at least volunteer for a coastal cleanup is an especially good way to get involved in your new local community. You can show your respect for the sustainability and conservation efforts of locals as a new local. In a place popular for tourism, it’s easy to just hang out with other expats and tourists, without really needing to get involved locally. But if you do give back to your new home, you’ll feel more included and invested there. Working hand-in-hand with locals to mitigate any negatives will help you enjoy all the positive aspects of your new home even more. We can all be better neighbors. Why not start by just picking up some trash? But then wash your hands, because the stuff people leave behind is nasty. Keep up with me via random newsletters by filling in the subscription box below. And I’m on Facebook, Instagram, and Twitter so let’s be friends!